EXIDE Starter Battery Start-Stop AGM EK800. 1x EXIDE Starter Battery Start-Stop AGM EK800. 61 21 7 598 773. 1968 ccm, 140 KW, 190 PS. 1997 ccm, 180 KW, 245 PS. 2996 ccm, 190 KW, 258 PS. 1796 ccm, 115 KW, 156 PS. 2143 ccm, 100 KW, 136 PS. 2143 ccm, 125 KW, 170 PS. 1796 ccm, 100 KW, 136 PS. 1991 ccm, 135 KW, 184 PS. 1499 ccm, 100 KW, 136 PS. 1998 ccm, 141 KW, 192 PS. 1595 ccm, 115 KW, 156 PS. 2143 ccm, 120 KW, 163 PS. 1984 ccm, 170 KW, 231 PS. 1995 ccm, 105 KW, 143 PS. 1995 ccm, 160 KW, 218 PS. 1991 ccm, 265 KW, 360 PS. 2143 ccm, 150 KW, 204 PS. 1995 ccm, 147 KW, 200 PS. 1997 ccm, 175 KW, 238 PS. 1991 ccm, 155 KW, 211 PS. 3436 ccm, 243 KW, 330 PS. 3436 ccm, 250 KW, 340 PS. 1598 ccm, 100 KW, 136 PS. 1598 ccm, 125 KW, 170 PS. 1995 ccm, 85 KW, 116 PS. 1995 ccm, 135 KW, 184 PS. 1796 ccm, 150 KW, 204 PS. 3498 ccm, 225 KW, 306 PS. 6208 ccm, 336 KW, 457 PS. 2773 ccm, 150 KW, 204 PS. 2995 ccm, 220 KW, 300 PS. 1968 ccm, 130 KW, 177 PS. 1968 ccm, 120 KW, 163 PS. 2979 ccm, 225 KW, 306 PS. 2480 ccm, 250 KW, 340 PS. 1995 ccm, 120 KW, 163 PS. 2993 ccm, 190 KW, 258 PS. 2993 ccm, 155 KW, 211 PS. 1998 ccm, 170 KW, 231 PS. 2979 ccm, 240 KW, 326 PS. 1984 ccm, 162 KW, 220 PS. 5204 ccm, 449 KW, 610 PS. 1995 ccm, 125 KW, 170 PS. 1998 ccm, 203 KW, 276 PS. 2995 ccm, 245 KW, 333 PS. 1798 ccm, 106 KW, 144 PS. 1995 ccm, 110 KW, 150 PS. 1999 ccm, 110 KW, 150 PS. 2179 ccm, 110 KW, 150 PS. 2179 ccm, 140 KW, 190 PS. 1999 ccm, 177 KW, 241 PS. 1995 ccm, 100 KW, 136 PS. 1984 ccm, 185 KW, 252 PS. 2143 ccm, 130 KW, 177 PS. 1995 ccm, 140 KW, 190 PS. 1496 ccm, 85 KW, 116 PS. 1997 ccm, 135 KW, 184 PS. 2996 ccm, 245 KW, 333 PS. 3604 ccm, 210 KW, 286 PS. 1798 ccm, 140 KW, 190 PS. 1968 ccm, 110 KW, 150 PS. 2967 ccm, 155 KW, 211 PS. 2967 ccm, 160 KW, 218 PS. 1991 ccm, 180 KW, 245 PS. 2967 ccm, 200 KW, 272 PS. 1956 ccm, 125 KW, 170 PS. 1496 ccm, 70 KW, 95 PS. 1991 ccm, 205 KW, 279 PS. 1598 ccm, 130 KW, 177 PS. 2299 ccm, 58 KW, 79 PS. 2299 ccm, 72 KW, 98 PS. 2480 ccm, 265 KW, 360 PS. 3800 ccm, 283 KW, 385 PS. 1968 ccm, 88 KW, 120 PS. 2480 ccm, 270 KW, 367 PS. 2996 ccm, 270 KW, 367 PS. 2151 ccm, 75 KW, 102 PS. 2151 ccm, 90 KW, 122 PS. 3800 ccm, 276 KW, 375 PS. 1968 ccm, 135 KW, 184 PS. 1995 ccm, 165 KW, 224 PS. 1499 ccm, 75 KW, 102 PS. 2148 ccm, 60 KW, 82 PS. 2148 ccm, 75 KW, 102 PS. 1968 ccm, 62 KW, 84 PS. 1968 ccm, 75 KW, 102 PS. 1968 ccm, 103 KW, 140 PS. 1968 ccm, 132 KW, 180 PS. 1984 ccm, 150 KW, 204 PS. 1968 ccm, 150 KW, 204 PS. 1991 ccm, 160 KW, 218 PS. 1991 ccm, 280 KW, 381 PS. 1461 ccm, 80 KW, 109 PS. 1798 ccm, 130 KW, 177 PS. 1984 ccm, 183 KW, 249 PS. 1999 ccm, 132 KW, 180 PS. 1995 ccm, 170 KW, 231 PS. 1685 ccm, 85 KW, 116 PS. 1995 ccm, 136 KW, 185 PS. 1685 ccm, 104 KW, 141 PS. 5204 ccm, 397 KW, 540 PS. 1984 ccm, 169 KW, 230 PS. 1984 ccm, 140 KW, 190 PS. 1968 ccm, 100 KW, 136 PS. 2967 ccm, 230 KW, 313 PS. 1999 ccm, 114 KW, 155 PS. 1984 ccm, 132 KW, 180 PS. 1499 ccm, 165 KW, 224 PS. 1598 ccm, 81 KW, 110 PS. 1598 ccm, 118 KW, 160 PS. 3604 ccm, 208 KW, 283 PS. 2996 ccm, 200 KW, 272 PS. 1988 ccm, 220 KW, 300 PS. 2497 ccm, 257 KW, 350 PS. RS performance 2.5 quattro. 1968 ccm, 90 KW, 122 PS. 2967 ccm, 150 KW, 204 PS. 2967 ccm, 180 KW, 245 PS. 1798 ccm, 125 KW, 170 PS. 2179 ccm, 120 KW, 163 PS. 1998 ccm, 135 KW, 184 PS. 1998 ccm, 165 KW, 224 PS. 2998 ccm, 250 KW, 340 PS. 1998 ccm, 185 KW, 252 PS. 2995 ccm, 228 KW, 310 PS. 1984 ccm, 155 KW, 211 PS. 1951 ccm, 100 KW, 136 PS. 2480 ccm, 294 KW, 400 PS. 2477 ccm, 79 KW, 107 PS. 1950 ccm, 143 KW, 194 PS. 2143 ccm, 88 KW, 120 PS. 2987 ccm, 195 KW, 265 PS. 5461 ccm, 310 KW, 422 PS. 2151 ccm, 60 KW, 82 PS. 2461 ccm, 103 KW, 140 PS. 2995 ccm, 200 KW, 272 PS. 2706 ccm, 195 KW, 265 PS. 3436 ccm, 232 KW, 315 PS. 2401 ccm, 120 KW, 163 PS. 1951 ccm, 85 KW, 116 PS. 2401 ccm, 96 KW, 131 PS. 4966 ccm, 225 KW, 306 PS. 2685 ccm, 125 KW, 170 PS. 1951 ccm, 85 KW, 115 PS. 5439 ccm, 270 KW, 367 PS. 1998 ccm, 88 KW, 120 PS. 1870 ccm, 60 KW, 80 PS. 1870 ccm, 74 KW, 101 PS. 4196 ccm, 219 KW, 298 PS. 4196 ccm, 291 KW, 396 PS. 1870 ccm, 60 KW, 82 PS. 1870 ccm, 74 KW, 100 PS. 2979 ccm, 170 KW, 231 PS. 4172 ccm, 228 KW, 310 PS. 2461 ccm, 128 KW, 174 PS. 2401 ccm, 96 KW, 130 PS. 1995 ccm, 85 KW, 115 PS. 2148 ccm, 110 KW, 150 PS. 2148 ccm, 80 KW, 109 PS. 3199 ccm, 140 KW, 190 PS. 3199 ccm, 160 KW, 218 PS. 2464 ccm, 99 KW, 135 PS. 2494 ccm, 141 KW, 192 PS. 3123 ccm, 188 KW, 255 PS. 4163 ccm, 246 KW, 335 PS. 2967 ccm, 165 KW, 225 PS. 2736 ccm, 142 KW, 193 PS. 2148 ccm, 65 KW, 88 PS. 5439 ccm, 428 KW, 582 PS. 2698 ccm, 132 KW, 180 PS. 2698 ccm, 120 KW, 163 PS. 2721 ccm, 150 KW, 204 PS. 2987 ccm, 165 KW, 224 PS. 3724 ccm, 170 KW, 231 PS. 2720 ccm, 152 KW, 207 PS. 3189 ccm, 184 KW, 250 PS. 1995 ccm, 90 KW, 122 PS. 2497 ccm, 130 KW, 177 PS. 2401 ccm, 136 KW, 185 PS. 4163 ccm, 257 KW, 350 PS. 2967 ccm, 171 KW, 233 PS. 2400 ccm, 93 KW, 126 PS. 2179 ccm, 118 KW, 160 PS. 2497 ccm, 160 KW, 218 PS. 2464 ccm, 107 KW, 146 PS. 2148 ccm, 70 KW, 95 PS. 2464 ccm, 107 KW, 145 PS. 1995 ccm, 84 KW, 114 PS. 1995 ccm, 66 KW, 90 PS. 2773 ccm, 154 KW, 210 PS. 1956 ccm, 103 KW, 140 PS. 2976 ccm, 160 KW, 218 PS. 5461 ccm, 285 KW, 388 PS. 1995 ccm, 130 KW, 177 PS. 2996 ccm, 160 KW, 218 PS. 2993 ccm, 145 KW, 197 PS. 1968 ccm, 105 KW, 143 PS. 3999 ccm, 309 KW, 420 PS. 2179 ccm, 112 KW, 152 PS. 2698 ccm, 140 KW, 190 PS. 1995 ccm, 96 KW, 131 PS. 1995 ccm, 150 KW, 204 PS. 1956 ccm, 120 KW, 163 PS. 1995 ccm, 127 KW, 173 PS. 1968 ccm, 125 KW, 170 PS. 2148 ccm, 85 KW, 116 PS. 2987 ccm, 150 KW, 204 PS. 3498 ccm, 190 KW, 258 PS. 3996 ccm, 216 KW, 294 PS. 2773 ccm, 140 KW, 190 PS. 2773 ccm, 162 KW, 220 PS. 2967 ccm, 176 KW, 240 PS. 2995 ccm, 213 KW, 290 PS. 3197 ccm, 199 KW, 270 PS. 3197 ccm, 195 KW, 265 PS. 2987 ccm, 170 KW, 231 PS. 2400 ccm, 120 KW, 163 PS. 2464 ccm, 84 KW, 114 PS. 2143 ccm, 105 KW, 143 PS. 1995 ccm, 155 KW, 211 PS. 2996 ccm, 155 KW, 211 PS. 4691 ccm, 331 KW, 450 PS. 1598 ccm, 85 KW, 116 PS. 4361 ccm, 331 KW, 450 PS. 1984 ccm, 188 KW, 256 PS. 2.4 Hybrid D6 AWD. 2400 ccm, 158 KW, 215 PS. 1796 ccm, 80 KW, 109 PS. 1598 ccm, 75 KW, 102 PS. 1685 ccm, 100 KW, 136 PS. 2179 ccm, 147 KW, 200 PS. 2979 ccm, 235 KW, 320 PS. 2706 ccm, 202 KW, 275 PS. 3436 ccm, 239 KW, 325 PS. 1598 ccm, 70 KW, 95 PS. 1997 ccm, 160 KW, 218 PS. 3996 ccm, 209 KW, 284 PS. 6208 ccm, 373 KW, 507 PS. 1984 ccm, 165 KW, 224 PS. 1995 ccm, 115 KW, 156 PS. 3498 ccm, 185 KW, 252 PS. 2480 ccm, 228 KW, 310 PS. 2143 ccm, 70 KW, 95 PS. 6208 ccm, 358 KW, 487 PS. 6208 ccm, 380 KW, 517 PS. 2979 ccm, 250 KW, 340 PS. 3996 ccm, 267 KW, 363 PS. IMPORTANT NOTICE ABOUT PART FITMENT TO VEHICLE. Cars have different modifications and options, even if your model is mentioned in listing it does not guarantee that the item will fit your car 100% and therefore YOU ALSO NEED TO MAKE SURE THAT ORIGINAL PART NUMBER FOR NEEDED PART IS MENTIONED IN LISTING ITEM SPECIFICS SECTION. We will give you proper part number for needed spare part. Packages sent by courier require signature. If you need our assistance, please let us to know. If you see that the package that courier tries to deliver is damaged, please fill up the claim form or do not accept it. 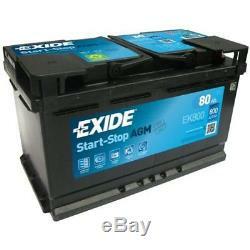 The item "EXIDE Starter Battery Start-Stop AGM EK800" is in sale since Tuesday, January 16, 2018. 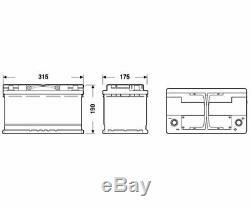 This item is in the category "Auto & Motorrad\ Teile\Auto-Ersatz- & -Reparaturteile\Autoelektrik\Batterien".eu" and is located in RIGA. This item can be shipped worldwide.